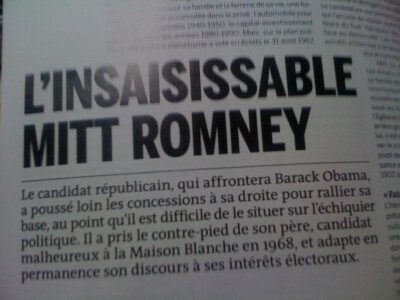 It seems to have worked out just perfectly that my first year in France is an American election year. I came with the intention to understand the culture of France and advance my level of French but what has been the most interesting part is learning about French culture and simultaneously critiquing and comparing it with our own systems in the States. One thing that has really stood out is the interest that France takes in American politics. Whereas in the United States, we tend to take little to no interest in international politics unless we feel threatened by someone who came into power. And even then, it’s usually only the most politically informed who seem to know about international politics with any sort of depth. I’m sure we could all take a lesson from that, because we aren’t the only one’s living on this planet. 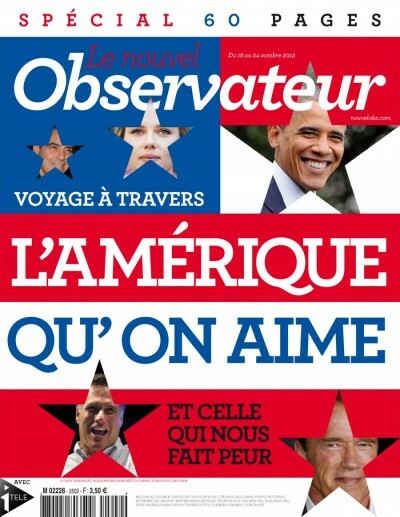 Another plus, not only do the French seem more often politically and internationally informed, according to a recent study done by BBC, France is the country with the highest support for Obama. However, by living here, that fact is pretty clear. An easy way to depict this is by showing some of the numerous magazines that feature articles about the upcoming election. 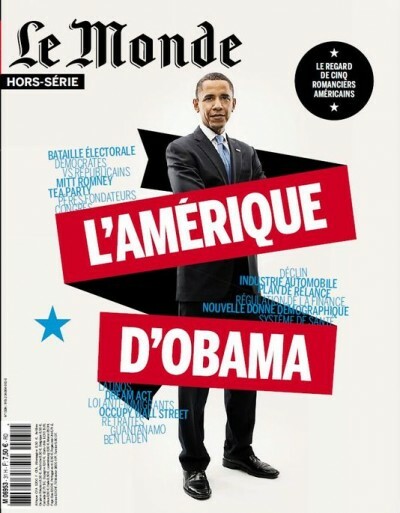 “Obama’s America”; the cover of the most well known magazine series in France. They published this magazine with a full, detailed description of current state of the United States and the context and implications of this in the upcoming election. 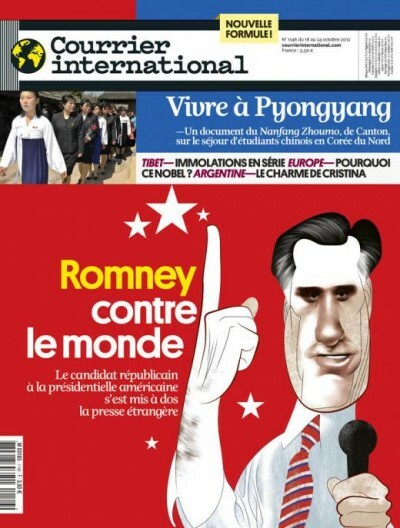 This one reads, “The America That We Love, And Those Who Scare Us.” With clear intentional placement of Obama next to the words, “the america that we love” and Romney next to “those who scare us”. After posting a few of these photos on my facebook page, an American friend of mine living in Nantes as well cleverly stated, “France loves to hate Romney, and I love France.” Which in my opinion pretty well sums it up. This year I will be starting college in France and I am going to France for two reasons. One being that I love France, its language and culture; the other being that I will be paying roughly $400 for my annual tuition without scholarships, grants, loans taken out or federal aid. (And additionally, I am still able to apply for federal aid for my housing). I am not able to go to a respected university in my own country without going into debt for the next few decades. It wasn’t always this way. And it doesn’t have to be. Since the 1980’s the percentage of the federal budget that has been spent on education has decreased significantly, while the cost of education has skyrocketed and increased more than 5x the rates of inflation. Some argue that we can’t afford to put more money into public universities. I say that’s a lie. We waste plenty of money into defense spending on weapons we will never use. Some defense spending is of course important, but to invest hundreds of millions of dollars into things we have no need for, or will never use is fiscally irresponsible. What we can’t afford is committing an entire generation of educated people to the debt sentence. People starting their lives with tens of thousands of dollars in debt will not only severely damage our economy but it will also alienate entire groups of people who are brilliant and have potential that will either never be able to develop it or be struggling too hard to pay back into loans to be able to invest in their dreams. The tuition costs we have now specifically hinder growth and that is not what education is about and it is not what our country says we’re about either. We say that we are the country of possibilities that anyone who works hard can make their way in the world. So then why am I someone who has worked hard for years needing to leave my country just to have access to a decent education without starting my adulthood in debt? I have stayed in the top 5% rankings in my class in one of the best schools in the country, a National Honor Society Member, took 10 AP classes, 5 honors classes and 5 classes that were considered college in high school classes for which I received college credit. I was a JV athlete in cross-country, a captain and varsity athlete in gymnastics and a varsity athlete in track and field in my high school. Additionally, I have babysat since I was 12 and babysat with an additional job from the time I was 16. And this year, on top of those two jobs, I had an internship with Darcy Burner. So the fact that I didn’t receive enough scholarships to make school reasonably priced is not based on the fact that I didn’t work hard or didn’t do well in school. For every dollar in scholarships available there are 2 dollars of tuition. In the past, this number was reversed. So, why are we not all in the streets? We’ve normalized the way in which we deal with tuition and higher education but that doesn’t make it right. We need to fight for our right to an education. As a country we seem to agree with that from elementary school until high school so what makes higher education any different? We can do better than this. We can fight for our right to education. If not an education that is as cheap as it is in France, at least something that is more manageable for the average citizen.The students of this country need to step up and stand together to fight for access to education without going into debt before it’s too late. 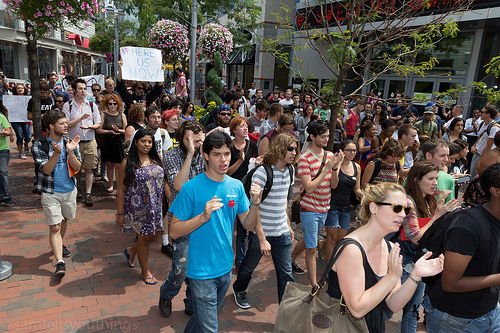 COLUMBUS, Ohio – Students from across the country marched from Ohio State University Student Union to President Obama’s campaign office to hold a press conference yesterday, calling into question the injustices of our current economic and political system. In an era where our political process is gridlocked by the influence of money and corporate power, our society has systematically diverted resources from the bottom to the top to fund a frenzy of profit seeking. The demonstration highlighted how our electoral system and politicians have failed our youth on the critical issues of education, gender equality, racial justice, environmental sustainability, and basic respect for human rights. Neither party has the audacity to confront these injustices, nor do they attempt to facilitate any type of connection with us on these issues, which disproportionately affect women, LGBTQ people, youth, and people of color. The current situation has demonstrated that we cannot passively depend upon our leaders to save our society. We call for American youth to take action much like students across the globe in places like Quebec, Mexico, Chile, Spain, and Puerto Rico, who are mobilizing to demand their rights. Democracy cannot exist without demonstration and debate in public spaces. This fall, regardless of where we lie on the political spectrum, it is crucial that we come together on campuses across the country to reclaim our future before it’s too late. Join us November 14th-21st as part of a global week of student action, demonstrating that we in the U.S. are committed to global justice and the international student movement. Here. Us. Now. At another incredible keynote speech today at Netroots Nation 2012 titled “Criminal Justice in America”, there were a few examples mentioned of issues related to the Trayvon Martin case you may not know of. I decided to pass on a few that were mentioned in the key note, other panels, as well as find a few more of my own examples. Racial profiling needs to be eradicated. The only way to do that is first by knowing where the problem exists. A program that gives police the ability to stop, question and search anyone that they have “reasonable suspicion” of committing criminal activity. Supporters say that it reduces crime, opponents question whether the police really have “reasonable” suspicion of the people that they stop. About 580,000 people were stopped in 2009, 55% of which were African-American and a large portion was also Hispanic. Only 6% of the stops resulted in arrests. “The sentences for crack offenses need to fall to a level in line with the punishments for powder,” said Rachel King, an ACLU Legislative Counsel. “There is no rational medical or policy reason to punish crack more severely than powder. Cocaine is cocaine.” In the powder cocaine cases in 2000, 57% were against Latinos and 30% against African-Americans, even though the vast majority of powder cocaine users were white. 84.7% of crack cases were against African-Americans, 9% against Hispanics and only 5.6% against Whites. Where in reality, 64.4% of users are white. The federal mandatory minimum prison sentence disparity between cocaine and crack is 18 to 1, which was improved in 2009 from a disparity of 100 to 1. Yes, it is a right. Most rights are restored to criminals after they leave jail, however voting is not one of them. Some states require you to petition the governor if you would ever like your right to vote to be restored after being in jail. There are multiple hotlines for people to call if they just “suspect” someone of being illegal, both national and local. Those are just a few, feel free to leave more example in the comments and I’ll add them to the list. There is hope, the End Racial Profiling Act has been introduced and needs to be given more support! As a first timer at Netroots Nation, I really didn’t know what to expect beyond that it would be incredible but even so, the convention has really exceeded my expectations beyond words. So many of the speakers and people that I’ve met this weekend so far have been amazing but the speech that nearly brought me to tears along with many others in the audience was from our very own Darcy Burner. The following is the video of the entire Keynote called the War on Women and if you have the time, watch all of it. The main speakers were Darcy Burner, Elizabeth Warren, and Mazie Hirono. However, if you just want to watch Darcy’s speech, skip to 7:30 and it’s roughly 15 minutes long. The part I really wish had a visual of the audience in video was when Darcy Burner asked the audience to hold their applause for a minute and have any woman who has had an abortion and was comfortable expressing it openly to stand up in the audience. Moments later, she asked everyone who will stand with them in support to stand up as well and nearly every person in the room stood up. It was a really beautiful moment.